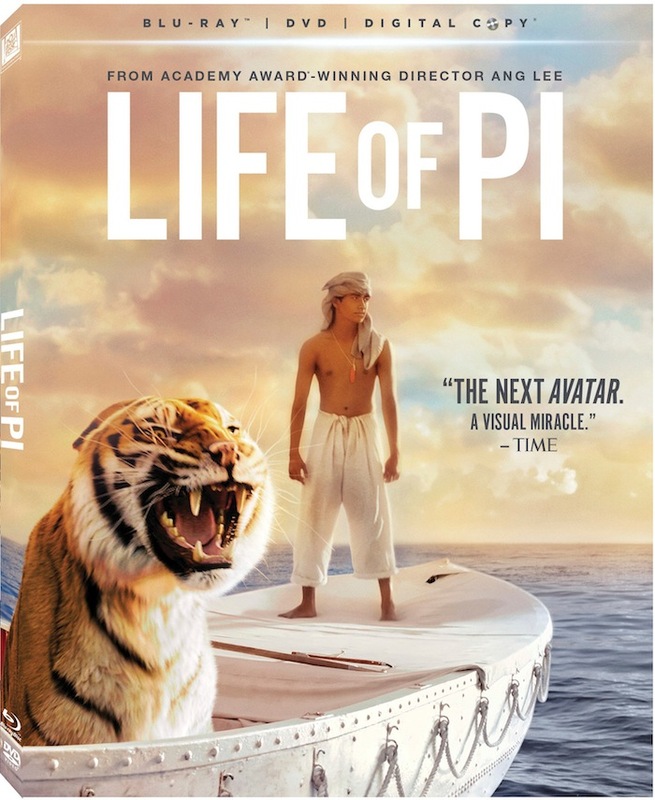 Life of Pi comes to Blu-ray and DVD on March 12th. This fabulous Oscar winning family movie is about Pi Patel, a young man on a fateful voyage. I highly recommend watching this heartwarming family movie with the whole family. We really enjoyed the way the movie started off with a beautiful Tamil song and vivid pictures of animals in a Pondicherry Zoo. Pondicherry or Puducherry is a place in South India influenced by the French. The architecture and feel of the area is beautifully portrayed in the movie. My children couldn't wait for the part when the adventures of Pi started in the sea. It was funny to watch how Pi or Piscine Molitor Patel and Richard Parkerthe Bengal tiger, got their names. The scene where the family was ill-treated by the cook in the ship because they were Indian was heartbreaking. This type of racial discrimination and prejudice still exists in our society... more about that in another post. I felt really sad when I was watching the scenes of Pi loosing his family and when he retells the story. Pi Patel and the fearsome 450 lb Bengal tiger are the only survivors of the shipwreck. Pi did everything possible to survive by putting his faith in God even in moments of despair. Although Pi knows life is about letting go of things, he regrets not being able to say goodbye in the movie to many people. It was amazing to see this young boy trying to make the best of everything he had without giving up hope and believing that God did not create us in vain. I think this is something many people these days should remember as we see there are lots of people that commit suicide and loose control of their life because of their lack of belief in the higher power. The wonderful special effects will be really enjoyed by everyone such as the jelly fish lighting up the dark ocean. It was amazing to see how it was filmed with the tiger so close and the Meerkat in the carnivorous island. This drama, adventure movie is based on the acclaimed best-selling novel from Yann Martel that has been published in 40 languages. This magical adventure of hope, wonder, survival and the power of the human spirit is wonderfully directed by Ang Lee. The documentaries in the bonus feature of the blu-ray are a must watch. This movie won four oscars for best director, original score, cinematography and visual effects. 2 people from US and Canada can win this giveaway by entering through the rafflecopter below before March 31st. To be eligible please follow all the social media networks on the rafflecopter and comment. Update: The winners are Arik and Jo-Anne. I want to see this movie because it sounds like this young man endures many hardships and survives a horrible ordeal. I also enjoy movies that are visually stimulating and from the review I can hardly wait to see for myself. Reside in Ontario, Canada. I want to watch this because of the cinematography. I am in Canada. I love to watch movies that have something to do with India. I am in Canada I want to watch because it's a family movie! I am in US. I love to watch this movie. Canada. I love to watch this movie because Ang Lee is an awesome director. Im in Canada. I want this movie because i read the book. I'm in Canada. I'd like to see how the film compares to the book. I am in Canada. I want to see this movie because I've read the book and I want to see if what I've imagined is the same as how the movie was put together. I'm in the U.S. and I really want to see this movie. Even though there are heartbreaking parts, the fact that the main character relies on his faith, and perseveres through that faith. I am in the US. I have been wanting to see this movie since it came out. The previews make it look like a great movie. I am in Canada, I love to see this movie after reading your review and heard so much about it through media also. The animals and the special effects. I live in the US, and I would love to see this film, because it looks like a film that I could see myself getting lost in. I am from the US and after reading the review I want to watch this movie to see Pi go through all his ups and downs and still believe in God, in many Gods. USA. movie seems contemplative. Always good. I'm in Canada. I remember when this book came out how anxious I was for it to be made into a movie. Now it's finally here. I line in the US. I have read the book and LOVED it. I can only imagine the movie looks fantastic. I am in Canada. I would like to see it because the writer is from my home town but also because of the awards it has been recognized for! US, want to see the big kitty. I am in Canada here, I would love to see this movie after the review because of the heartwarming tone. I am big on heartwarming and family. I live in Canada. I'm interested in watching this movie about how a young boy survives a tragedy and gains strength and hope. I live in the US. I love movies about animals and this sounds like a good one with a good story behind it. I'm in Canada, and I want to watch it after reading about the awards it has won. I live in BC and I'd love to see this after reading the book and the awards it won! I'm in Canada and I want to see the movie because I really enjoyed the book and the movie is supposed to really beautiful to look at. I live in the US,I would love to see this movie because it would be a great movie to watch with my family.It is so hard to find something that the whole family can enjoy together.I love your review on this movie,it makes me want to see it that much more. I'm in Canada, and I want to watch this movie because it looks beautiful! In the US, my family has been waiting to see this, your review matches what I thought the movie would be from previews. I am holding off on reading the book until after I see the movie. I live in Canada. I'd like to see it because it sounds like a beautiful movie. I'm in Canada and I would like to watch this movie to see this young boy trying to make the best of everything he had without giving up hope and believing that God did not create us in vain. I live in Canada. I think the cinematography of this film is what appeals to me most. I'm in Canada! I want to see this movie as my Dads name is Richard Parker just like the character in the story! I heard it's a great movie! I am in Canada. After reading your review I am anxious to see this movie. It sounds like it has a good message in it and I like that type of movie. The fact that it won so many awards also tells me it will be a great movie. I'm in the US. I have read the book so naturally I'd like to see the movie and compare the two. I am from Canada. I would love to watch the movie to see how it is similar/different from the book. I would like to win because I saw it on the 2013 Oscars I would like to see what makes it an Oscar Winning Movie. I m in Us. my kids love Richard Parker. I like that one of the main characters is an animal.